Red Bandits are an excellent choice for perfecting a landscape that emphasizes the woodland garden theme. This low maintenance shrub is perfect for informal hedges or borders. Vibrant colors of pink and red display on the flowers which bloom in spring and last throughout summer. More About Kalmia latifolia "Red Bandit"
Native to the eastern U.S. ranging from Maine to Florida. Robust, dense and symmetrical when young, becoming open, loose and picturesque with gnarly branches and limbs in old age. It takes a little more effort to grow the Kalmia but the rewards are well worth it. If not using in a naturalized area the Kalmia can be pruned to retain a dense and compact form. Pruning is done soon after the flowers have faded as next seasons buds form on the new wood. Attempting to mimic the Kalmia's natural conditions when planting is very important to insure its survival. Organic matter should be aged pine bark, peat or compost. Avoid coarse pine or hardwood bark that may not have good water holding capacity and could limit root development. Organic layers should extend approximately 8 inches out from the stem before tapering off, becoming even with grade approximatly 18" from stem. Maintain irrigation until roots have established in the backfill. Consider fall transplanting to take advantage of higher root growth rates and avoid competition with spring shoot flushes. Choose planting locations that are cooler such as shaded areas or north or east sides of buildings. Fertilize in the spring after blooming with a food for acid loving plants. 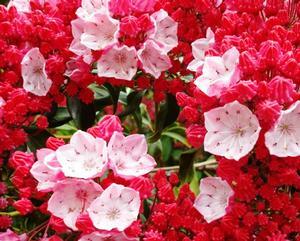 Kalmia latifolia, known as Mountain laurel is a member of the Heath family. Tight clustered buds emerge in a magnificent display of star like flowers in late spring. One of the best and most loved native shrub. 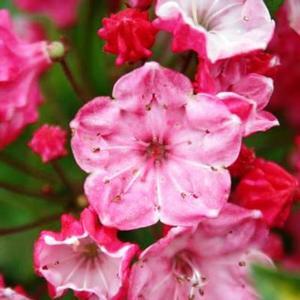 The Kalmia will thrive in shade but will produce more flowers in full sun or light shade. Take extra care in planting to insure its survivability. There are many hybrid cultivars available. Caution: Can be harmful if ingested.